A space exploration milestone has fallen. On December 15, 2010, NASA's Mars Odyssey orbiter became the longest-running spacecraft at Mars, breaking the 3,340-day record set by NASA's Mars Global Surveyor, which operated at Mars from September 11, 1997 to November 2, 2006. NASA launched the Mars Odyssey orbiter on April 7, 2001, and it arrived at Mars October 24, 2001. 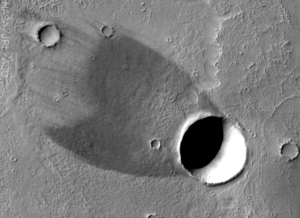 Odyssey made its most famous discovery – evidence for copious water ice just below the dry surface of Mars – during its first few months, and it finished its radiation-safety check for future astronauts before the end of its prime mission in 2004. The bonus years of extended missions since then have enabled many accomplishments that would not have been possible otherwise. "The extra years have allowed us to build up the highest-resolution maps covering virtually the entire planet," says Odyssey Project Scientist Jeffrey Plaut of NASA's Jet Propulsion Laboratory, Pasadena, Calif. These maps are the product of the Thermal Emission Imaging System (THEMIS), a multiband camera which began mapping February 19, 2002. To note Odyssey's breaking the longevity record, the THEMIS team, working with NASA, has prepared a slide show of remarkable images taken by the instrument. Swooping around the Red Planet in a 2-hour orbit locked on the Sun, Odyssey makes two passes over any given spot on the ground each Martian day, once at a local time of about 4 p.m. and again in the predawn hours around 4 a.m. As a result, THEMIS scans the planet day and night. "The day-night contrast is highly important for how THEMIS operates," says Philip Christensen, the instrument's designer and Principal Investigator. Christensen, a Regents' professor of geological science in Arizona State University's School of Earth and Space Exploration, is the director of the Mars Space Flight Facility on the Tempe campus. THEMIS, he explains, is a camera that images Mars simultaneously in five visual and 10 infrared bands or colors. "The daily temperature differences between afternoon and the predawn night can tell scientists a lot about nature of the surface materials — whether they're durable and compacted like rock, or loose and friable like sand and dust." For example, rock is slower than sand to warm up during daytime, but it holds heat much better at night. When THEMIS images the ground late at night, exposures of rock and hard sediments glow with residual warmth, while sandy and dusty areas — much warmer than rock during the day — look dark and cold to THEMIS' heat-sensing eye. In addition, Christensen notes, "By comparing how the surface looks at all of THEMIS' different wavelengths, we gain insights about the mineralogy of the surface rocks and sediments." This information is highly important, he says, for NASA's goal of looking for Martian environments that might have once harbored life. One of THEMIS' most important results is the best map of Mars ever compiled. 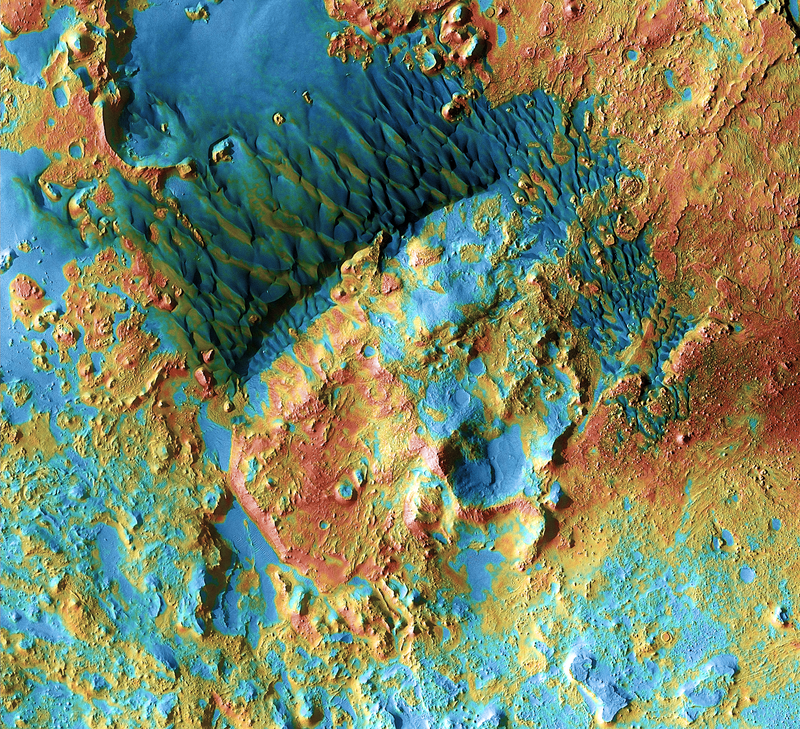 "Parts of Mars have been mapped at higher resolution by other instruments," says Christensen, "but this is the most detailed map so far that covers the whole planet." Made by assembling nearly 21,000 individual images, it shows Mars at a resolution of 100 meters (330 feet) per pixel. How long will Mars Odyssey and THEMIS continue? The spacecraft's supply of maneuvering fuel can keep it operating for years to come, and THEMIS remains in fine working order. 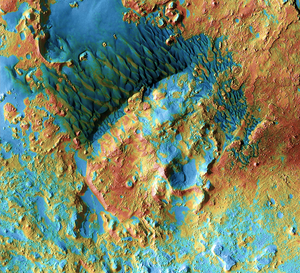 Although THEMIS has mapped Mars at 100 meters' resolution, mission scientists plan to expand the area of Mars mapped by THEMIS at visual wavelengths, where the instrument's resolution is 18 meters (60 feet). NASA has planned future work for Odyssey, in addition to having the orbiter continue its own science and its ongoing relay service for the Mars Exploration Rover mission. If needed, controllers will adjust Odyssey's orbit so the spacecraft is in a favorable position for a communication relay role during the August 2012 landing of NASA's next rover, the Mars Science Laboratory (MSL). 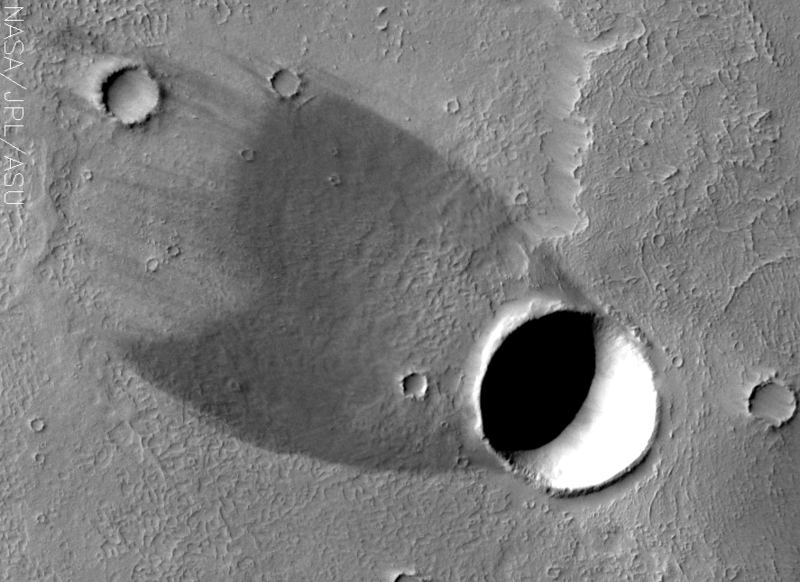 Says Christensen, "THEMIS provides a crucial link between the early whole-planet views from Mars Global Surveyor and the highly focused and detailed studies of later instruments, both from orbit and on the Martian surface." Wind shadow and real shadow combine with an impact crater to produce a "comet." Winds blowing over the crater's rim have scoured the ground behind the crater free of light-colored dust, leaving exposed a relatively bare lava flow. The crater spans a width of about 3 kilometers (2 miles). Sand dunes shaped like blue-black flames lie next to a central hill within an unnamed, 120-kilometer (75-mile) crater in eastern Arabia Terra. False colors depict the nature of the ground surface: Areas in bluish tints have more fine sand at the surface, while redder tints indicate harder sediments and outcrops of rock.